Should Men Be Allowed A Cheat Day In Relationships? Although my dating and social development material is necessary for personal growth, I do want to make a point to begin writing about money. Money allows us to date, money affords us greater freedom to be creative, and money allows us to support a family. I recently ran into some research by way of Author Thomas Corley, who documented the daily habits of 233 wealthy people and 128 of those less fortunate for five years. Thomas Corley states that it is not just about what’s going on in business that allow some to build wealth, it is also their daily habits and activities that are responsible for the reason some are wealthy and some aren’t. Before I divulge into the research let me just say that there is no guarantee that if you do all these things you will become rich. Nor are these habits all that these people are doing to become rich, but I do believe it’s obvious that the more characteristics you share with the rich the higher your chances of being rich. If you did everything Kobe Bryant did on and off the basketball court, there’s no guarantee you would be as good as him, but you would be a lot better than most. 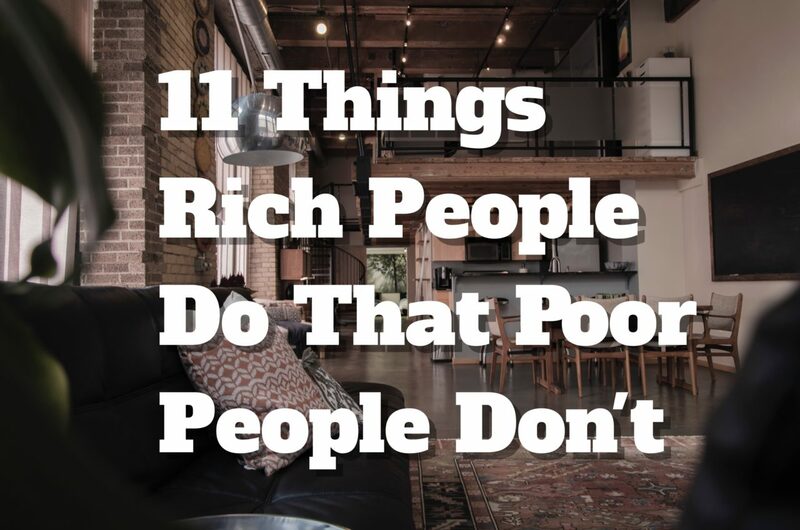 So here are a few things rich people do differently than poor people. 1. 80% of wealthy make Happy Birthday calls vs. 11% of poor. Anyone familiar with the law of attraction understands that you reap what you sow. Those that go out of their way to “give” are always “given to.” Even if that giving is just warm feelings of appreciation. A smile for someone else today could turn into a dollar for you tomorrow. Money is energy; you give energy helpful to others and you get energy helpful to you. 2. 70% of the wealthy eat less than 300 junk food calories per day. 97% of poor people eat more than 300 junk food calories per day. Although health is wealth, we are also what we eat. A clean diet produces clean thoughts. A poor diet produces a poor life. There was a time in which people spent 70% of their income on making sure they had access to quality food. Food is our fuel; the better our fuel the better we function, the better we function the more we can accomplish. 3. 23% of wealthy gamble. 52% of poor people gamble. Do you spend more time sitting around hoping to get lucky or putting in the time, energy, and effort to create your own luck? Although gambling can be fun and entertaining amongst those with self discipline, the wealthy to tend to look for areas with a higher probability for a ROI when using their money for the purpose of getting money. 4. 81% of wealthy maintain a to-do list vs. 19% for poor. An organized thinker has an organized life. One that keeps track of their money always has money, just as one that keeps track of their daily activities tend to get more done than those that don’t. The more you get done the more wealth you can create. 5. 63% of wealthy parents make their children read 2 or more non-fiction books a month vs. 3% for poor. If a man doesn’t grow mentally his pockets do not grow financially. When we educate ourselves we increase our capacity to create for others. The more we create for others the more will be given to us by others. 6. 88% of wealthy read 30 minutes or more each day for education or career reasons vs 2% for poor. I want to connect 5 and 6 because I find these numbers to be alarming. Just 2 and 3 percent of those that aren’t rich are actively reading educational material? 30 minutes isn’t at all much; many of us spend 30 minutes day dreaming about things we won’t remember everyday. By turning that time into just 30 minutes of reading, wealth can be added to our lives. 7. 6% of wealthy say what’s on their mind vs. 69% for poor. I was always taught that the more you know the less you’ll say. The rich spend more of their time showing you what they know as opposed to injecting their opinion and talking about what they know. Actions speak louder than words; actions pay more than words as well. 8. 6% of wealthy watch reality TV vs. 78% for poor. TV isn’t just entertainment. We are all products of our diets. What we put in our mouth, what we listen to with our ears, what we watch with our eyes, and so forth. Most reality TV Stars aren’t what you would call rich or wealthy. If we want riches and wealth we must watch those with wealth and listen to those with wealth. We become like that which we surround ourselves with. 9. 44% of wealthy wake up 3 hours before work starts vs. 3% for poor. Early bird gets the worm? You’ll have more than the person you are doing more than. The earlier you rise the more you can accomplish. 10. 63% of wealthy listen to audio books during commute to work vs. 5% for poor people. We can spend our time being entertained or we can spend our time learning. It is often said that smart phones are making us dumb, but this is not true. The way we use smart phones is what’s making us dumb. Are we using it an empowerment tool or as an escape from a life we are not comfortable with? 11. 84% of wealthy believe good habits create opportunity luck vs. 4% for poor. This ties back into the gambling one above. Wealth is created by good habits just as health is created by good habits. The more good we put out the more good we will draw back in. When we find someone thats deemed “lucky” most don’t know that they often take part in a lot of healthy habits privately that attract their luck. In closing, character is both defined by what we do when people are watching and when people are not. Those with the strongest character tend to have the strongest capacity to attract that which they want. It’s not always wealth, as everyone doesn’t have desire to be wealthy. But we should all have a desire to be the best us that we can be. Improving in the areas of life that we value so that we can increase our contribution to society. We weren’t created to be drones staring at lit up cell phones looking for entertainment. We were created to serve and be served by others. And the better our service, the more we will reap from those which we serve. If you are interested in more material from the founder of this research visit his direct website by clicking here. For One on One Live Coaching and Consultations via Skype, Phone, or Instant Messenger; Email: EddieFews@Gmail.com – ask about my free 20 minute consultation. Posted on June 4, 2018 June 4, 2018 by EddieFews	This entry was tagged Attract, Dating, love, money, rich, seduction, wealth. Bookmark the permalink. Where did you get these stats from? It’s fascinating if true! Click the word “Research” in the first paragraph for a link right to the guy that did the research. Ah… this is key. “70% of wealthy parents make their children volunteer 10 hours or more a month vs. 3% for poor.” This is everything for me. I been trying to help my family members for a while trying to raise their less motivated children. This sets up a lot of life experience vs those kids who are left alone or have single working parents. I really enjoyed this. Dating can be “whatever” from time to time. Now money, that’s what I’m all about. The consistency of the quality of these articles are valuable. Been reading everything you write for a few years now and I’m still here. Thank You for everything you do. Any good finance books you can recommend?